Street sign in Heidelberg, Germany. Of all the intellectuals of the previous century, Dr. Sir Muhammad Iqbal (1877-1938) holds a unique position at the beginning of the twenty-first. In all likelihood his ideas are going to play an increasingly more important role in shaping the world we live in. He is the only poet or thinker whose ideas were directly responsible for the creation of a new state and nation, officially claiming to be his brainchild - Pakistan. In addition, he is either officially the national poet or unofficially a household inspiration in several other countries including Iran, Kazakhstan, Kyrgyzstan, Tajikistan, Turkmenistan, Uzbekistan, and India. Study of his work and ideas is officially recognized as an academic discipline in its own right: “Iqbal Studies” is a fast-growing discipline in the countries of Iqbal’s influence, especially Pakistan. In the universities of Cambridge and Heidelberg, the academic stature of Iqbal is recognized by the existence “Iqbal Chairs”. Recognition of Iqbal as the foremost disciple of Maulana Jalaluddin Rumi is also on the rise: a symbolic grave of Iqbal may now be seen inside the compound of Rumi’s own mausoleum in Konya. 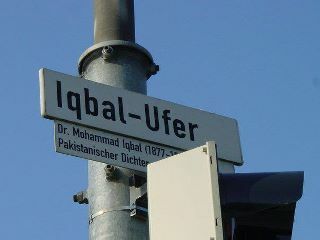 Places are being officially named after him in many other countries too: the bank of the famous river Neckar in Germany has been named “Iqbal-Ufer”, there is an Allama Iqbal library in Mauritius, and so on. Iqbal Academy Pakistan publishes material in more than twenty languages – on a regular basis. One-off publications about him and partial translations of his works are available in many more languages. There are more than 5000 books and perhaps more than a hundred thousand papers written about him – this is more than what had been written about any other literary figure, ever, within less than a century from their death. Unlike almost all other poets and thinkers from the 20th Century who got recognized as the greatest, the influence of Iqbal is not restricted to the intellectual community: his poems still captivate the hearts and souls of the masses – including the unschooled. His is a household name which is being passed on from mother to children and being called out in religious gatherings as well as pop concerts; his ideas are being owned by liberals, conservatives, progressives, Sufis, atheists, fanatics and altruists altogether. These are just a few glimpses into the international stature of Iqbal. This is the asset which every Pakistani is blessed to have as a birth-right. Whatever belongs to Iqbal practically belongs to every citizen of Pakistan – including the lowest of the low, and including those who have to sleep on the pavement because they have got no home to live in. Do we want to make use of this valuable asset which Nature has given us a free gift? I liked it. Look forward to reading more. It is intriguing just how widely diffused is Iqbal and his message. Yes, I *do* want to make (good) use of this valuable asset which Nature has given me (us)! Most Pakistani's take pride in saying we have an atomic bomb to our credit which is an accolade for us being the only Muslim state to have such a power. But I have always felt that a power to annihilate is not a power worth being proud off. But being proud of an intellectual, a life giver a soul saver is definitely worthwhile and from today I will proudly proclaim to be from the same soil as IQBAL. Great article. Iqbal has been underrated to some extent, but his popularity is growing and I am sure his true stature and contribution to the world will be recognised sooner rather than later. The like of Iqbal never will born again! How pathetic to think about it!! @ Amir, Thank you for this post. I am not Pakistani, and am most grateful for discovering Iqbal. He and his philosophy have broadened and deepened everything in this world around and within me.